Description: Blueberry cream pie is a yummy homemade treat that is tough to beat! With 100% pure berry filling and creamy sugar frosting, it's a classic snack that's great for dessert or anytime. 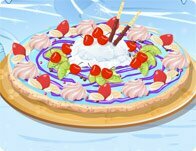 Instructions: Click on the floating kitchen and food items to prepare, bake, dress and serve a delicious home made Blueberry cream pie!